From November 15th to February 26th 2017, the Institut du Monde Arabe will be hosting the “Aventuries Des Mers” exhibition. The collection will take us on a journey throughout the globe, with the aid of some 200 hundred pieces, including the Fra Mauro map facsimile. Just a few days ago, the Institut du Monde Arabe has opened the “Aventuriers des Mers. From Sindbad to Marco Polo” exhibition to the public. Open Tuesday to Friday (10h – 18h) and weekends (10h – 19h), the exhibition is organized in collaboration with the MuCEM, the Museum of European and Mediterranean Civilization in Marseilles, and as the title suggests, it tells the tale of the most famous ocean explorers of the past. The main aim of the exhibition is to take the visitors through a maritime adventure, from the Mediterranean Sea to the Indian Ocean, following an itinerary created with the aid of optical devices, sound effects, images, travel diaries, and maps. Having as protagonists three of the greatest travelers of the past – Sindbad, Marco Polo, and Ibn Baṭṭūṭah – the exhibition gives prominence to the art of sailing also in terms of tools, i.e. 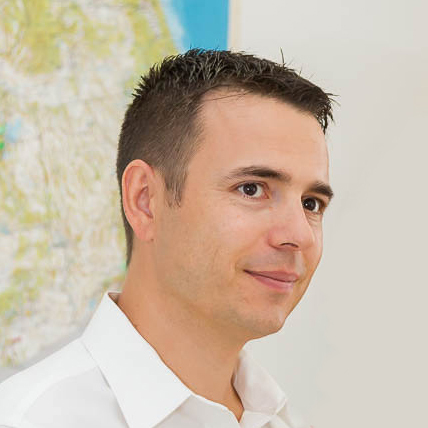 navigation instruments such as cartographic material. 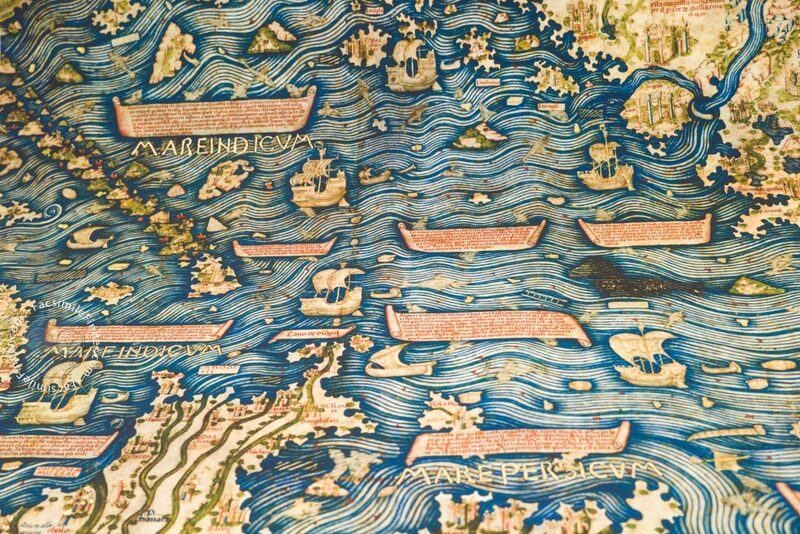 It is thanks to these instruments that sailors mastered the seas, and among the many maps featuring in the exhibition, a significant role has been allocated to the Fra Mauro map, present in this superb collection in the form of facsimile. The Fra Mauro map, dated around the year 1450, is a beautiful work of Italian production from the Venetian region, representing a break from the cartography of the Middle Ages. Evidence of this is the location of Jerusalem, which Fra Mauro moved from the world’s center to its geographical position in the Eurasian continent. The facsimile features an especially important representation of Africa, based on drawings and written sources to which Fra Mauro had exclusive access. The importance of this manuscript stands also in the fact that Fra Mauro was aware of the possibility of circumnavigate the African continent, a fact not known until that time because the Portuguese were experimenting the circumnavigation while Fra Mauro was producing this map. Also of extreme interest is the drawing of Asia, which was made on the base of the reports of Marco Polo and Nicolò de Conti. With the original safely stored in Biblioteca Nazionale Marciana, Venice, the Fra Mauro Map facsimile offers the chance to experience the adventurous voyages that travelers like Sindbad, Marco Polo and Ibn Baṭṭūṭah embarked upon, and relive their journey in the unknown provided with only a map as a guide. For those of us who just cannot be satisfied with one view of this beautiful cartographic specimen, we may have to go back to the exhibition for more or fetch a facsimile for our own collection. 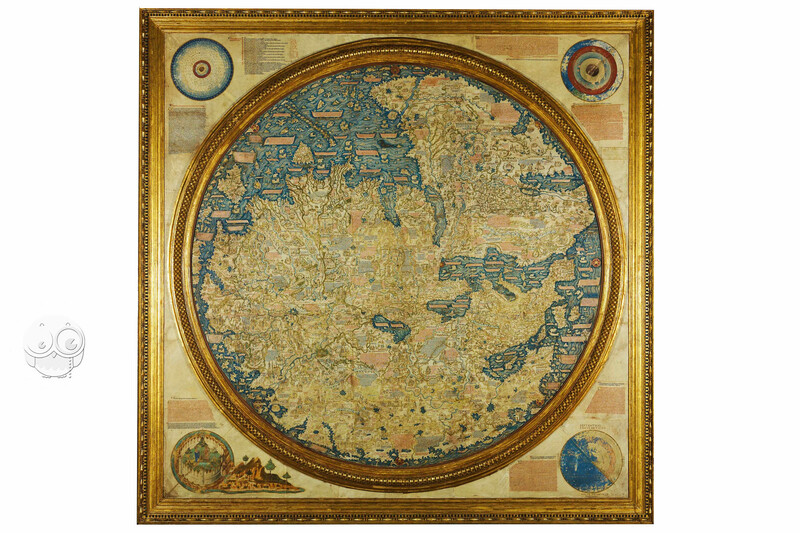 A few editions of the Fra Mauro map facsimile are in commerce, and Facsimile Finder even had a special edition made, of which a few examples remain. So don’t miss the opportunity to view this superb example of medieval cartography along with the rest of the collection at the Aventuriers des Mers exhibition in the Institut du Monde Arab until February 27th, 2017.